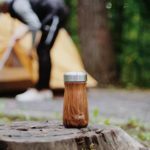 HOLIDAY GIFT GUIDE: For the Sustainably-Minded! Eco-friendly gifts are ALWAYS in style! By shopping with our environment in mind, the earth gets a little gift too! 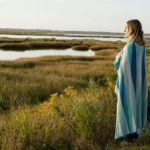 Eco-friendly throw blankets from Summer House Furnishings are made from recycled USA cotton, and add warmth and color to every room! 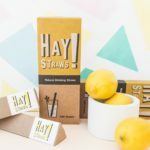 500 million plastic straws are disposed of daily in the United States alone, and Inside Out has a solution—Hay Straws! Made from natural wheat stems, they are biodegradable and plastic-free! 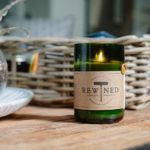 Rewined candles from Hazel Boutique are made from recycled wine bottles, and are filled with hand-poured soy wax and the unique scents that reflect the notes found in varieties of wine. Add some long stemmed-matches from Hazel to make the perfect hostess gift or stocking stuffer! 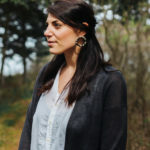 Made from renewable materials, these gorgeous Machete Earrings are an eco-friendly accessory that will make you look and feel amazing! 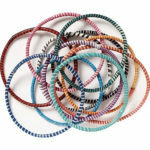 Made from recycled plastic flip flops, these colorful bracelets are fun, year-round accessories! 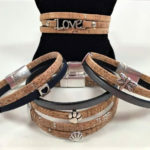 Stylish, handcrafted cork bracelets from Whims & Whatnots are natural, eco-friendly, comfortable, AND beautiful! A win, win? We think so! Some like it hot! Some like it cold! Some like in cute S’Well Tumblers from Spaces! Made with organic beeswax and jojoba oil, these reusable Beeswax Wraps are hand-washable, naturally anti-bacterial, and an adorable way to spruce up your fridge and reduce plastic use! 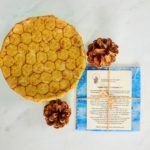 A cute and eco-friendly alternative to plastic wrap! 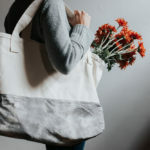 Made in Newburyport by kitchen + kraft, the naturally-dyed organic cotton Pom Pom Tote is just the best! This bag can hold anything and everything from toys to groceries, to yoga mats and beach essentials—a fantastic staple for all parts of life! Chic AND eco-friendly?? 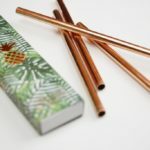 We’re loving these copper straws from Inside Out! 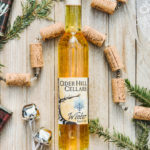 Hard cider from Cider Hill Farm (made exclusively with fruit grown on the farm!) won “Best in Class” and multiple Golds at the world’s largest cider competition! A unique and sustainable gift available at the farm store until December 16th. 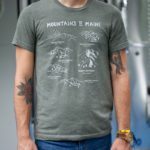 The “Mountains of Maine” Tee from Hills & Trails features eight of Maine’s mountains ranging from Katahdin to Tumbledown Mountain. Screen-printed with eco-friendly ink on a unisex triblend t-shirt. Who knew recycled goods could look THIS cool?! 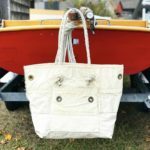 Stern Lines Deckhand Bags are made of ultra thick reclaimed canvas that have been fashioned with recycled Maine lobster rope handles for a weathered, nautical-chic look. These bags are not only a conversation starter but are a thoughtful nod to our New England roots.